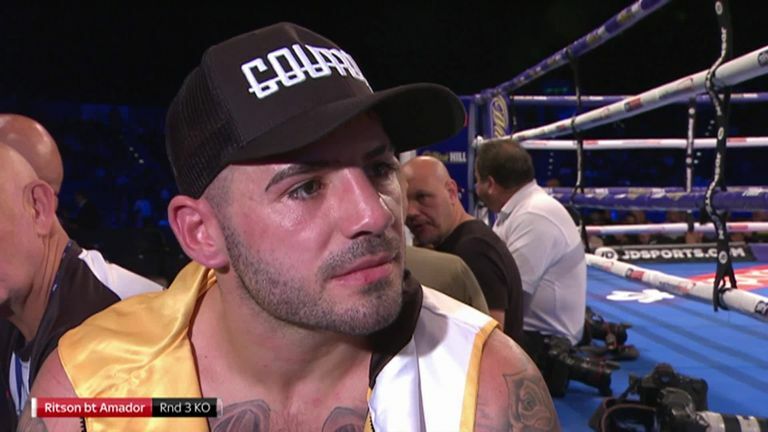 Lewis Ritson made no mistakes as he swiftly dispatched Oscar Amador ahead of a bid for European glory in Newcastle next month. The current British lightweight champion, who has exploded onto the scene over the last 12 months, again showcased his shuddering power early on, finishing his outclassed Nicaraguan foe with a spiteful body shot in the third. Ritson's attention will now turn to a much-anticipated shot at the European title against Francesco Patera in his home city on October 13, to be shown live on Sky Sports. Amador valiantly took the fight to 'The Sandman' from the first bell but it proved to little avail, the Nicaraguan unable to match the heavy-handed Ritson. Working behind a ram-rod jab, the North East star bashed up and broke down Amador, before a spiteful left to the body forced an end to proceedings, the Central American taking a knee and unable to return to his feet. "I'm injury-free, it's nice to get some rounds in the bank," Ritson said afterwards. "Hopefully, we have another big night on October 13, I'm prepared. Patera is durable, he can box and fight, we'll see what he brings. "I could have done 12 rounds tonight, I'm looking forward to the next one."